Built in 1919, this classic Chesapeake Bay beach cottage is historic but updated with all modern conveniences. 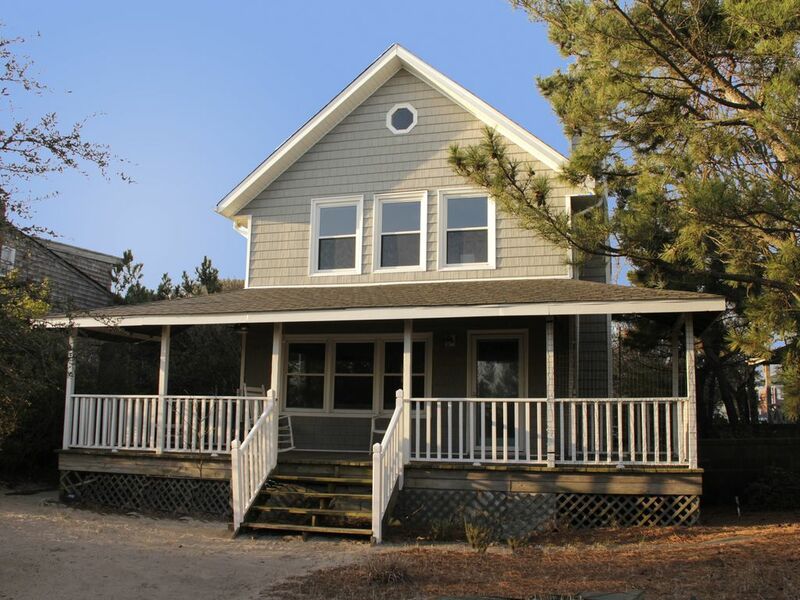 Privately situated behind a wooded dune and far from the street, this beachfront cottage has a wide pleasant porch and its own beach access. Downstairs you'll find a large full bathroom, a laundry room, and an open-plan dining room leading to a living room with large windows facing the Bay. Upstairs is a bathroom and two queen-size bedrooms. Ample private parking. Sleep-sofa in living room provides room for two. Interior just renovated, including all new hardwood floors on the lower level! We are a professional couple. This is the home we plan to retire to - so we take care of it with love! This cozy classic Ocean View beach cottage is nestled under a collection of live oaks with a porch facing the beach, a private trail over the dune, and a delightful dune-top bench for morning coffee. Situated on Ocean View Avenue, the house has easy access to local attractions while still providing a private, quiet beach getaway. In our recent renovation, we've tried to find the perfect balance between retaining this delightful cottage's original charm while providing all modern conveniences. We really enjoyed our time here-- the house was cozy and in a great location. We stayed here 10 weeks, and it was a great fit for our family. We were here during the winter months so didn't get to experience the beach and warm weather much, but still had fun nonetheless. We found the owners to be responsive and quick to address any needs or concerns we had. The neighbors are quiet, and we hardly saw anyone during our stay-- again, this could be different during the summer months, but for us it was a quiet and private retreat. We used Harris Teeter as our grocery, it was about 10 minutes away. Also, several grocery delivery and meal delivery services are in the area, so we loved that convenience too. A couple local places we really enjoyed for day to day living: Beach Belly's Yoga Studio and Lionshead Barber Shop-- both are only about a mile from the house. We would certainly come back and recommend to friends! This cottage is the perfect vacation home! Beautiful inside and out. We had a wonderful stay at Zoe’s cottage. Furnished with everything you need and located right on the bay. Loved waking to the sound of the waves and walking along a very peaceful beach. We traveled around the area and always enjoyed coming “home” and relaxing every night. Highly recommend this home and would definitely come back. Wonderful place. Enjoyed the outdoor space. Loved the pictures hanging on walls and the history of place. You can't ask for more than Zoe's Cottage as a beach cottage: the sound of the surf through the main bedroom windows at night; the beach just over the dune, but the dune and the trees provide privacy to the backyard; the back porch with gentle breezes where we ate breakfast every morning and had cocktails each evening; the bench at the top of the dune facing the bay with the lights of the Chesapeake Bay Bridge and Tunnel twinkling and ships and boats and dolphins going by; charming decor that was also comfortable and not too precious; a kitchen equipped enough for us to cook meals; and a comfy living room when weather doesn't cooperate. A plus for us was a drip coffee maker AND a French press with a whole bean grinder--one can have decaf and one can have caffeinated coffee if desired. There is a 7-11 at the corner for milk and ice cream and was truly a convenience. The house is as it appears in the photos. Note that there is a spiral staircase to the second floor that may be a challenge to very large suitcases like the one I travel with. I do not travel light. My husband had no problem with his. Marida was better than the best hostess, for many reasons. In addition, her recommendations for 2 seafood restaurants were spot on. The location is convenient for Norfolk, Virginia Beach, the Historic Triangle, Hampton, and Newport News. I'd stay there again, without hesitation. This was a cozy cottage, with a beautiful beach! So many wonderful adventures took place at this peaceful,clean and beach themed cottage. The linens and pillows were so cozy to snuggle into at the end of our day! The owner thought of everything, the kitchen had everything we needed to prepare meals. We crab hunted at night, fished off the beach, watched the dolphins jump and play and watched the ships. The beach was private and clean. We enjoyed and played a lot of the games in the cottage. We enjoyed the fishing pier down the road, and aquarium was really cool. My kids loved the water park at Bush gardens. The beach toys and beach equipment was a added bonus for us to enjoy! There is a ton to do. This was a perfect get away for my husband and I with our 3 kids! We hope to come back to visit Zoe's Cottage. We had such a nice time at Zoe's cottage! It was a perfect quaint cottage with private access to the beach. We have two elementary aged kids and they loved it. We spent mornings and evenings on the quiet porch out back and even enjoyed some rainy day time there. Being on the beach was wonderful. It was incredibly quiet - literally a handful of people on this huge beach. The water was perfectly warm and calm when the tide was going and had just the right amount of waves for the kids to use the boogie boards when the tide was coming in. If you're looking for a quiet and relaxing spot, Zoe's cottage is a hidden gem and Marida was extremely helpful and responsive to questions when planning our trip. Located on Ocean View beach overlooking the beautiful Chesapeake Bay. Residential neighborhood with a quiet beach with limited public access. Great restaurants, nearby shopping & movie theaters, easy access from Rt. 64. Tons of things do if you tire of lounging on the porch or beach: Stroll the boardwalk at Virginia Beach; dine or sightsee on the long, long Ocean View Fishing Pier; view denizens of the deep at Virginia Aquarium; step into the past at Colonial Williamsburg and Yorktown, play at Busch Gardens theme park or grab an ice cream and stroll Norfolk Zoo. Do some inside beachcombing in the antiques shops or get your culture fix at Norfolk's museums, ethnic restaurants, and concert halls.